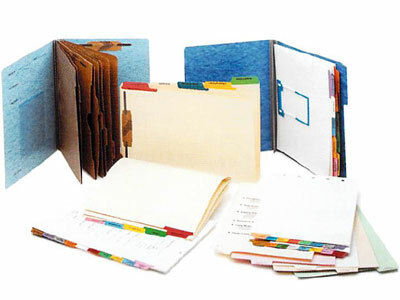 and many other paper stocks to choose from as well. Special paper requests are also accommodated. Tab size: indicates the tab’s extension from the index edge. The tabs shown below are actual size. Tab position: select from either side tabs or bottom tabs. Plan ahead! Consider leaving an empty position for future use. 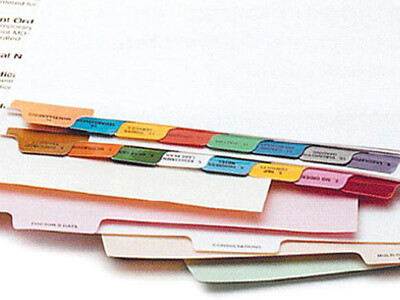 Select plain, printed or Mylar® tabs. 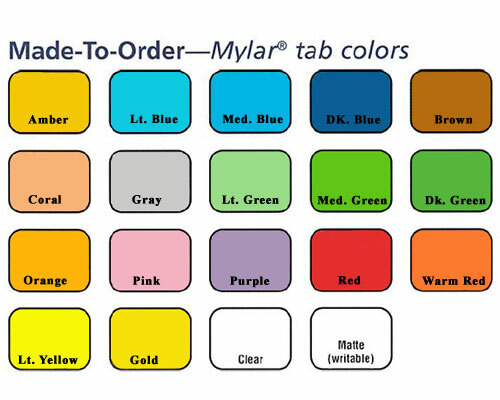 using printed Mylar® tabs, choose from our 19 colors below. Non-Collated: Each tab title is packaged individually. leaving an empty position for future use. within the body of the index. Increase durability of drilled holes for faster application. the holes can be reinforced with Mylar® tape. non-collated, individual titles are packaged together.